Judy Reeves (Judy.Reeves@nw.npuc.org A Lay leader at Hockinson Heights, WA Seventh-day Adventist Church, OR Conf) tells how they made their church newsletter evangelistic. Greg Brothers (gregbrothers@embarqmail.com Senior Pastor Lincoln City Seventh-day Adventist Church District, OR Conf) shares three simple tips to help your newsletter be read. Heidi Martella (Heidi.Martella@wc.npuc.org Communications Intern, WA Conf of Seventh-day Adventists) shares three keys for an effective e-newsletter and points readers to a valuable book with more information. Most every church has a large number of members that do not attend or rarely attend. What can be done to reach them? Often times they are not interested in what we have to say; they truly don’t seem open to hearing anything about the church, while others have just lost interest. A few years ago our Personal Ministries Committee decided to do something to draw these precious people back. At the end of our brain storming session, we decided to reach out to them with a monthly newsletter that focused on outreach. We thought the first six months they would probably throw it out, but then they might just scan through it- just to see what’s there. If we put in a wide variety of short articles, maybe one of them would catch their eye. 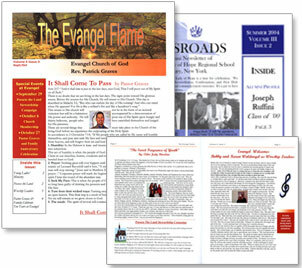 We decided to use as many local church members as possible to write articles. We wanted name recognition so, if and when, they did come back to church they would feel they already had a relationship with the authors. It worked, and in less time than we imagined, some of our lost members started coming back. What a thrill! Our cover page had an article by the Pastor, on the following pages we had a calendar, a Bible study plan for that month, a men’s corner, a women’s corner, a children’s page, a book review, a health nugget, a parenting section, an interview with a member, including their picture, a highlight from our school, a recipe and often a poem or some other filler. We used lots of graphics. Graphics are eye catchers. We found it also worked well for our interest list, past and present. It is a lot of work and maybe monthly is too much for your church. What ever the case, God will bless as we prayerfully reach out. 1. Keep it short — that way, you’re more likely to keep doing it. My advice: one page for news, with a church calendar on the back. 3. Keep it helpful — you want something your church members stick on the refrigerator because they keep referring to it. Your calendar, for instance, should include sunset times, birthdays, board meetings, school vacations and early releases, plus (in a multiple church district) just who is preaching where. And when it comes to news — don’t forget a monthly summary of just how your church’s budget is doing! Bonus: I use MicroSoft PUBLISH for my newsletter; with a little modification, it’s template for newsletters works pretty well. But one thing I don’t use is a lot of clip-art; IMHO, more than one or two “clips” on a page makes it look trashy. Last year, Washington Conference introduced an electronic newsletter called “Sailing with Jesus” which has emerged from a bi-weekly to a weekly news source. The most helpful resource in developing and maintaining this e-newsletter is a slim book: “E-Newsletters that Work” by Michael J. Katz. He succinctly answers a myriad of e-newsletter questions for small business owners (and others!) in a quick read of 141 pages. 1) Focus on the content. If what you have to say is not interesting, clear, compelling and of use to your readers, then everything else is a waste of time; yours and theirs (28). 2) Focus on the relationships. The primary reason that E-Newsletters are so powerful is because they provide a systematic means for growing and maintaining relationships (28). 3) Be genuine. Be yourself, and give your readers as much of an authentic taste of you [or your church] in every newsletter as you possibly can (29). While his audience is small business owners, the information is easily applicable to churches and ministries. Buy it new or used: the book is worth the price. Or visit your local library.